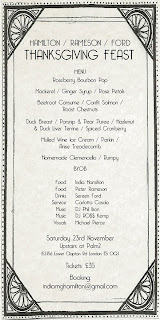 The team behind the Hallowed Feast at Palm2 are back with a special Thanksgiving meal on Saturday 23rd November. 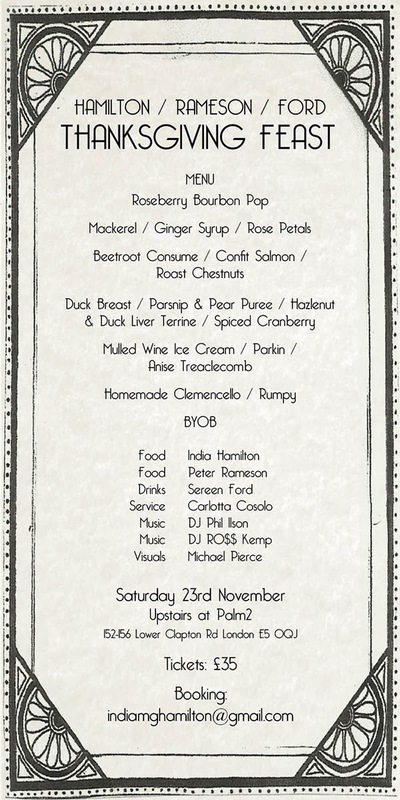 Full menu above (click the pic to enlarge it) and as with all events at Palm2 it's BYOB by buying wine from the shop below. At this next event Peter and I are aiming to surprise you with our Thanksgiving inspired dinner where we alter the setting for classic flavours. Sereen has invented a variety of cocktails and shorts to surprise your senses and to give you a lot to be thankful for. This chef team met at Le cordon Bleu where they studied the art of french cuisine. Since then India Hamilton has been developing her skills in trendy London restaurants such as the Wapping project and the Windsor castle and Peter Rameson has expanded his kitchen to include equipment that reflects the most exciting professional kitchens in order to push his understanding of modernist cuisine. Sereen Ford is an exciting new mixologist who's imagination of infusions couple with a knowledge of cooking brings a twist to the team."